One of the delights of walking round the town is spotting information about its past. In 1922 the Tradesmen’s Association, a forerunner of Stamford Chamber of Trade & Commerce, now Stamford Chamber of Commerce, decided to erect 17 “historical mural tablets” marking places of special interest in the town. The previous year Mr T Sandall who lived at Rusholme Lodge and Mr F Carter living at Greyfriars, both in St Paul’s Street, had put up plaques on their residences marking the former sites of Holy Trinity/St Stephen’s Church and the Greyfriary. These 19 plaques were all finely made in bronze. Three more were erected at some time after the first set, making a total of 22. Sadly the value of the metal probably made them attractive to thieves and over the years four disappeared. 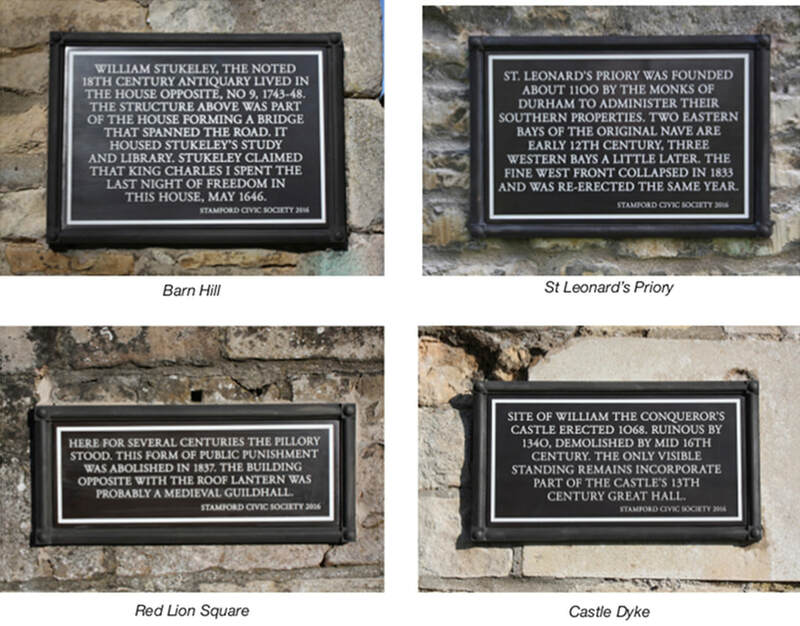 These had been positioned in Barn Hill on a wall opposite the Methodist Church, on All Saints’ Church- yard wall in Red Lion Square, on the wall at the bottom of Castle Dyke marking the Leet Hall of the castle, and at St Leonard’s Priory. Thanks to the combined efforts of the Town Council, members of the Civic Society and the Stamford & District Local History Society, with generous funding from a range of sources including the Harry Skells Trust, the missing plaques were replaced this year. It was also a good opportunity to bring some of the old wording in line with current historical thinking.